This was amazing! Words can not even express the beauty of this location. This was part of our destination wedding in Alaska for Sheryl and Rob in June of 2016! What you see here is the Matanuska Glacier. Yes, we walked on a glacier for photos. 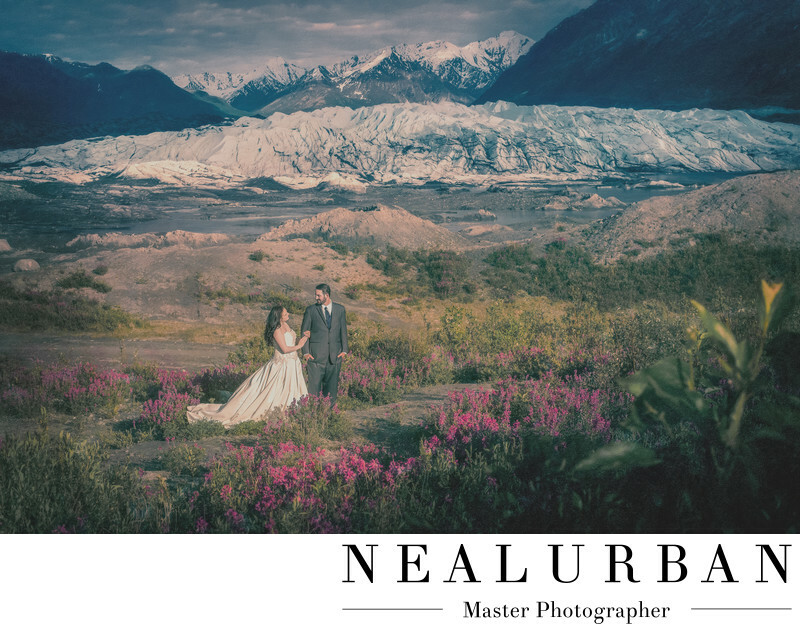 This image was taken right after we finished photographing the bride and groom on the actual glacier. The park was going to close and it was time to hike back to the car. Neal saw these pretty purple flowers and stopped for a minute. He looked like he was in deep thought. He grabbed Sheryl and Rob before they got too far ahead and said we need to do one more photo. He had another angle of the glacier that was too pretty to not use. This session was done after their wedding day, so we could go off roading with the wedding dress. The bride actually had her biking boots on underneath the dress! Great idea! I think she came more prepared than we did when it came to shoes! I can't get over the landscapes in this image. You have snowy mountains in the distance, Matanuska Glacier in the center, then greenery and flowers in the foreground. We needed hats and gloves while on the glacier. But just a few yards away, we could be in shorts! It was so cool! I think this image speaks for itself. It was breath taking and such a dream come true to photograph this lovely couple at this location! We wish we could go back and do it all over again. Or just go back and do more photos! Location: Matanuska Glacier, Alaska United States.